Where exactly is the thumb saddle joint located? Why is carpometacarpal osteoarthritis so painful? Are there other symptoms associated with carpometacarpal osteoarthritis in addition to pain? Could other joints be affected by osteoarthritis? Is polyarthrosis the same as polyarthritis? How can we distinguish both diseases? The thumb saddle joint is one of the most used joints of the hand. Almost every activity of the hand places the thumb into the opposite position to all other fingers. 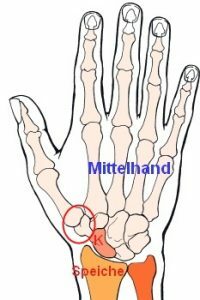 This movement mainly takes place in the thumb saddle joint (wrist area). As every other joint the thumb saddle joint also contains cartilage. 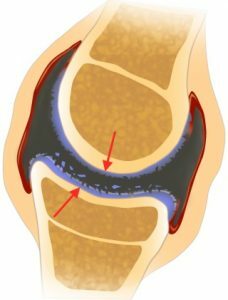 When affected by osteoarthritis this cartilage wears off early (The cartilage tissue dies off prematurely). The area in the diagram in the red circle shows the thumb saddle joint. The image above shows the index finger pressing onto the thumb saddle joint. The thumb saddle joint is formed by the trapezium bone and the base of the first metacarpal bone. The trapezium bone is shaped like a saddle in the area of the thumb saddle joint. This particular shape of the trapezium bone allows for great mobility in the thumb. Caption: The diagram shows the common structure of a joint. The blue area shows the cartilage. One can easily see the damaged surface of the cartilage which equates to osteoarthritis (breakdown of joint cartilage). The left shown image clearly shows the principle of a joint which is affected by osteoarthritis: the cartilage (red arrows) is only partially existent (kind of like an old tire with worn down profile). In a healthy joint the cartilage prevents the bony components of the joint from friction while in motion. When the cartilage is worn off the blank laying bones rub against each other. This is what triggers the pain particularly when the affected area is in motion or under strain. But even long after the straining situation is over, the pain may continue to linger in an osteoarthritis-damaged joint. In a healthy joint the cartilage acts as a shock absorber or buffer. The damaged cartilage no longer functions as shock absorber between the bones, it has no buffing capabilities. Bone rubs against bone which is often painful and leads to an increased articular effusion. (looks like a swelling on the outside). Yes. 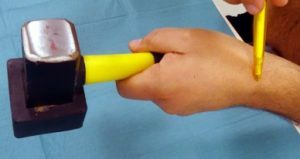 A typical symptom is decreased grip strength of the thumb. Opening a jar or twisting open a doorknob can suddenly become a challenge. In isolated cases a badly healed fracture close to the joint may cause carpometacarpal osteoarthritis (rizarthrosis). A Bennett fracture or a Rolando fracture may lead to a post-traumatic carpometacarpal osteoarthritis. Most of the times however the condition is not the result of an accident, in fact genetic inheritance factors play an important role. Women are much more likely to be affected by carpometacarpal osteoarthritis than men. The reason is that women have much more flexible ligaments. Almost 10% of all women during menopause are affected by osteoarthritis of the carpometacarpal joint. Yes! Unfortunately that is rather common. Along with the thumb saddle joint many times we also find osteoarthritis in the small finger joints (distal interphalangeal / DIP joints or proximal interphalangeal / PIP joints). In addition osteoarthritis may affect a variety of other regions within the body. The typical areas that are affected by arthrotic changes are hip and knee joints as well as the spine. Many times the metatarsophalangeal joint of the big toe can be affected with osteoarthritis. These cases are referred to as polyarthrosis. No! 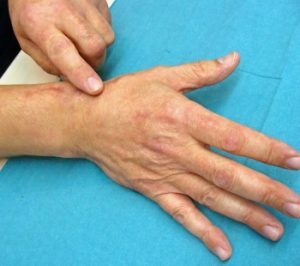 Polyarthritis (also called rheumatoid arthritis) at first glance is spelled very similar to polyarthrosis however both conditions differ fundamentally from each other. The rheumatoid arthritis is a systemic autoimmune disease of the entire connective tissue which also affects the joints. In addition many times it will also extend to the tendons and tendon sheaths. In severe cases even the blood vessels and some of the inner organs may be affected. The polyarthrosis “only” affects the joints and the tissue in the immediate vicinity of the joints. In the early stage of both diseases it is sometimes not easy to distinguish between them. However, if the condition exists for an extended period of time, the typical course of the disease will simplify the distinction between polyarthritis and polyarthrosis greatly. In concluding this informational paper I would like to encourage you to address all questions you may have in connection with the thumb saddle joint and rhizarthrosis with your attending physician as this document does not constitute a replacement to a personal examination or consultancy through your doctor.